Color me shocked, but Affleck is a tremendous Batman, in some respects the most Batmanish interpretation we’ve ever had. He’s smart, suave when he has to be, brutal when he needs to be, has great chemistry with Jeremy Irons’ Alfred, and is the true star of the film. The story opens with the millionth retelling of Bruce Wayne’s parents’ murder, and cuts to the Metropolis battle from MoS, which is a gripping sequence at ground level and makes us understand why this guy would ultimately want to kill “The Superman” — as he’s referred to in an opening title card. (It also makes Wayne a superhero version of Howard Lutnick, the Cantor Fitzgerald executive who lost hundreds of employees and his own brother in the September 11th attacks.) And about this Superman gent: I still maintain that there’s a great Superman lurking in Henry Cavill, if they’d only let him do something besides feel oppressed by his powers and a world that doesn’t quite know what to make of him. You get hints of that, especially when he’s interacting with Amy Adams’ Lois Lane, but you can tell that Snyder — and WB execs, surely — don’t want to pull the trigger on making him the cheerful big blue Boy Scout from the Donner days. But look over at Marvel, and what they’ve done with Steve Rogers and the Vision, two square characters who embody aspects of the Superman character. They work splendidly, and so could a sunnier Superman. (Hell, when they Amalgam-ed Marvel and DC back in the day, Captain America and the Man of Steel were combined into one. They’re in many ways the same guy.) Cavill’s Superman is good — let him be great is all I’m saying. Have you ever wanted to see a movie Batman take out a roomful of gun-toting thugs? This movie delivers. As many have pointed out, it looks like a video game — but isn’t that exactly what a cape-wearing bat-ninja fighting should look like? Just an observation: It doesn’t necessarily mean that you’re old, but when the movie that young Bruce Wayne goes to see with his doomed parents is one that’s been released in your own lifetime, you sure ain’t a kid no more. I never thought I’d see a jar of piss used in a superhero movie, but here we are. Much has been made about the Knightmare sequence, and what the hell it means. Is it a dream? A vision? A message from the future? From Darkseid, whose parademons are featured prominently? It’s odd, I’ll give it that. And that was the Flash yelling at Bruce in the Batcave, right? Something about Lois? Was he warning him about the events of this movie? Or something for an upcoming movie? It makes you go “Whah?” and not in a good way. I pride myself on being somewhat knowledgeable on this material (a dubious brand of pride, but pride nonetheless) and I couldn’t make heads or tails of it, and I can imagine an uninitiated general audience member’s head exploding Scanners-style as they try to process what it means. Is every movie now going to have to go to great lengths to make it clear that there are no normals in harms way as our heroes are duking it out? It was clunky in Avengers: Age of Ultron: Rescuing Civilians: The Motion Picture, and some of the dialogue here is at great pains to point out that parts of the city are abandoned. We get it, all right? We get it. As for the titular fight, I was worried that the motivations would feel superficial. This is a profound vulnerability, especially since, as even Honey Nut Cheerios giveaway comics will point out, these two should be friends — and have been friends for longer than most of us have walked the Earth. But the motivations on both sides fit, with Batman finally driven over the edge to finish off this guy who could kill them all, and Superman forced to do battle to save someone’s life. Superman even tries to use reason to defuse things at first, calling Batman Bruce, before they both say to hell with it and start punching the living hell out of each other. Yes, there’s Kryptonite involved, multiple times. Yes, there’s Frank Miller imagery from TDKR. 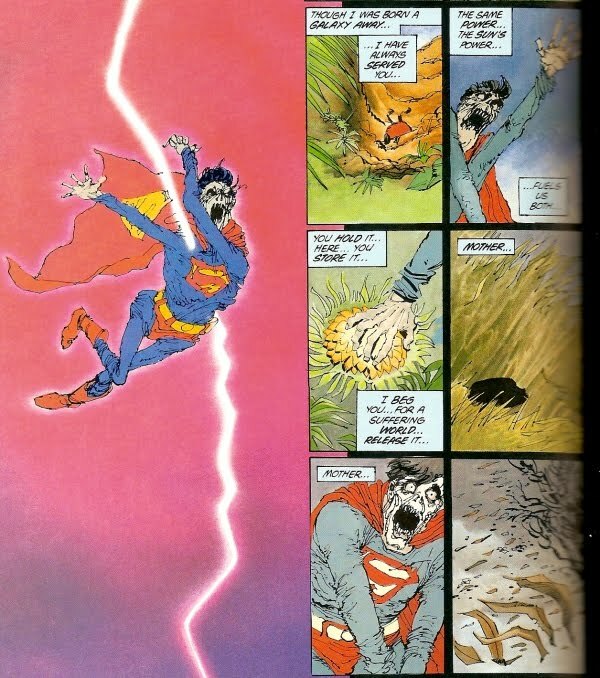 (The dessicated, gaunt, post-nuked Superman even makes an appearance later on.) There’s a winner — mainly because one wants to kill the other, while that other truly doesn’t want to return the favor. And then it’s defused by something that plays into my biggest complaint. This could have been better. I’m no great fan of Snyder’s work — he focuses too much on the visual and doesn’t think stories through — but you get the impression that the failings here have less to do with his guiding hand and more to do with studio execs worried about profit margins, their own jobs, and getting their own Avengers-ish cash cow up and running. To that end they made a gigantic, incredibly expensive movie that meanders too often off its chosen path. 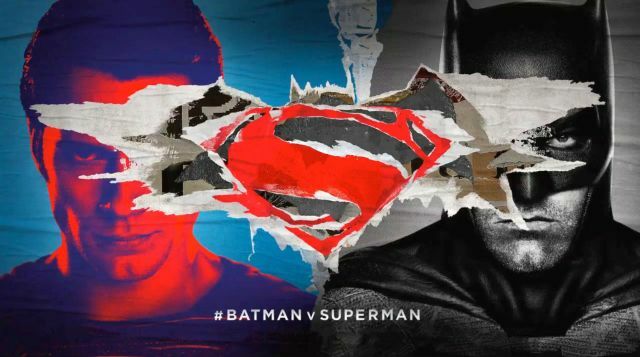 But the money spent is up there on the screen — this movie looks good, even if they skimped on Doomsday and just left the Lord of the Rings cave troll template in the final cut. I think many of the criticisms of this movie, just like with its predecessor, are way overblown. As I stated above, I want to see this movie again, which is a rarity for me these days. The last movie I saw more than once in a theater? Man of Steel. Take that as you will — as either coming from a Superman nut with blinders on or a guy with questionable movie taste or someone with his own tastes and opinions. Three and a half Kryptonite spears out of five.